We are planing to build iOS app which will be able to recognise different kind of heavy vehicles and depending on their types we should be able to provide relevant information. We have gone through various resources and guidelines of Vuforia, which educates about object recognition, Image recognition etc. We are wondering if Vuforia is able to recognise such type of heavy vehicles or it is limited to small size objects & toys only. Is there any possibilty or anyone has tried for relavent objects? 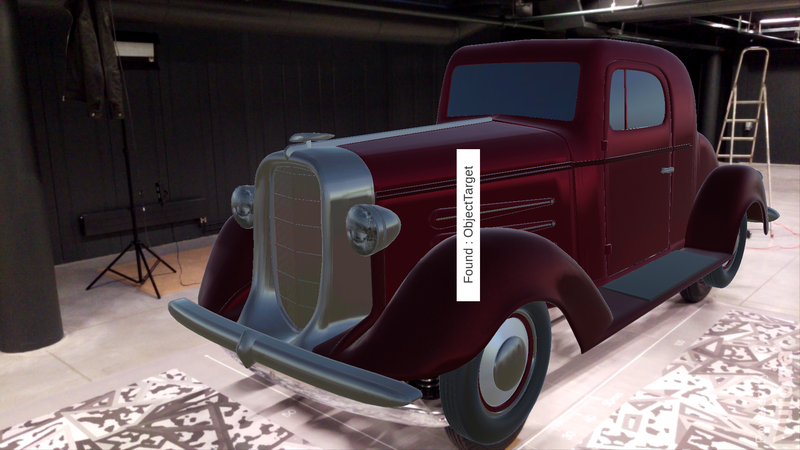 Yes, it is possible to scan large objects and augment on the some content. 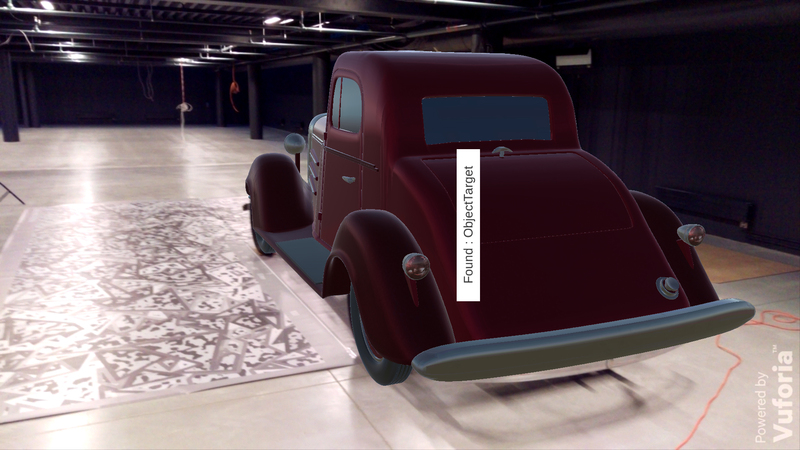 We are currently working on full size car recognition (user scan old car chassis to see how this car looked 80 years back and we augment on this chassis digital body and other stuff). We printed large tracker aproximately 3x4 meters, placed car on that tracker and with Samsung Galaxy S6 did the scanning process. It is important to use S6 and newer Samsung Galaxy models for scanning, because with this phone you can get most accurate results. We tried to scan with HTC M8 and M9, but results was really dissapointing. Even with special ligtning we got only about 730 points, scanning process took about 15minutes. But with Samsung in 5 minutes we got about 940 points without special lightning and result was really good for our project. When we finish this project I can post result on forum and share my expierence with large object recognition. This application will be only for iPad Air 2 and available locally on client devices in their museum. 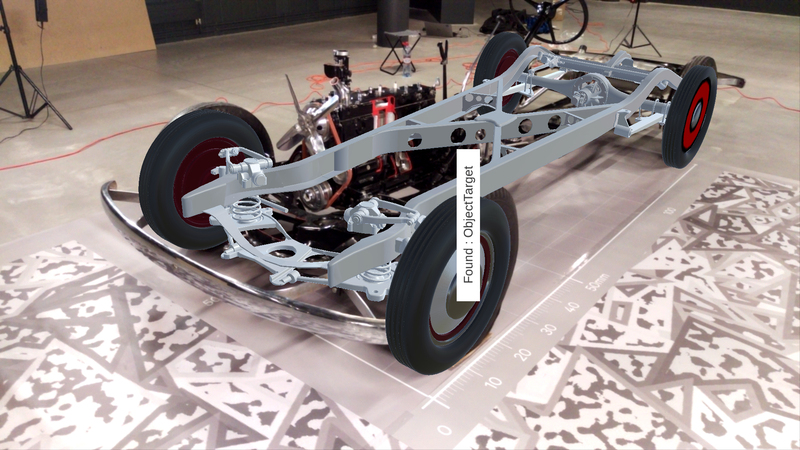 There was made first tests on iPads, camera is working pretty well, ipad recognizes scanned object and rendering on car digital content which in our case is car body. But our app on S6 works better, object is recognized little bit faster. If you have some questions I can help you out. I propably need to scan lager object too and was thinking of the exact same solution, you did. Is everything working fine with this setup? Is the recognition acurate? So how do we go about printing a really large target? Will the standard download work for a 3x4m print? I'm currently working on a project which is similar to what you have done. I want to scan an actual byke and later on augment content on it. like displaying cards which represent specific features of the byke. Its really good to see that object tracking has worked for you, I was looking into Vuforia 7 model tracking and was not satisfied with the results. if you could guide me or point me in the right direction it would really be a great help. What about the Model Target feature was preventing your satisfaction with the feature? Were you having trouble detecting or tracking?